India is a great nation where we have all the reasons to undertake the savings and same can be in form of saving in a bank or in a commodity as precious like gold. So we have adequate reasons to justify the gold purchase on Akshaya Tritiya. As per Hindu mythology, it is believed that Lord Ganesha st arted writing the great epic Mahabharata as dictated by Shri Veda Vyasa on the day of Akshaya Tritiya. Thus now the day has been associated with the day when gold can be purchased or new ventures can be started. 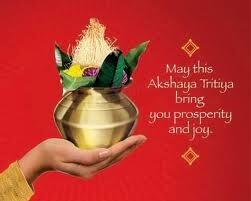 Thus People purchases Gold on Akshaya Tritiya day to retain the fortune and wealth forever. Thus Akshaya Tritiya is a way to improve your savings and inturn get the luck on your side as it is important to keep Indian Gods on your side in India to reap rewards. To be honest we like such festivals in India as it always keep us with some reserve in hand. It is very important to have the reserves as the life can never be rosy and this reserve helps us tide over the crisis. This was the reason that when whole world was reeling under recession, we could easily manage the same as we have grown with the concept that we have to save for the rainy day and it always hold us in good stead. Moreover gold purchase has twin advantages; i.e. it keeps your wife in good humour and you are able to have it as a secured investment which is appreciating in nature. Login with us for gold tip of the day and make money every day.